Pistorius Granted Bail : The Two-Way The Olympic and Paralympic sprinter is accused of premeditated murder in the Feb. 14 shooting death of his girlfriend. He says it was a horrible accident. Prosecutors say he knew what he was doing. Oscar Pistorius, standing at the dock Friday in a Pretoria courtroom. 10:55 a.m. ET: Declaring that Olympic and Paralympic sprinter Oscar Pistorius "has made a case to be released on bail," a South African magistrate on Friday set the stage for Pistorius to be set free while he awaits trial on the charge that he murdered his girlfriend. Chief Magistrate Desmond Nair announced that news after spending nearly two hours discussing the case, South African law and the history of bail. During that long ruling from the bench, Nair said Pistorius had "failed to show this court that there's a weakness in the state's case" against him. But, Nair added, the state's case is not "so strong and watertight" that it's obvious Pistorius would decide he "needs to flee or evade his trial." Nair said he does not consider the world famous athlete to be a flight risk, that the prosecution did not produce evidence that he has a "propensity to commit violence" and that there's no evidence Pistorius would try to "interfere with the state's witnesses." After a short adjournment following the announcement, Nair ruled that the bail would be set at 1 million South African rand (about $112,000), of which Pistorius would have to put up 100,000 rand ($11,200) in cash. Pistorius was also ordered to hand over his passport, stay in South Africa and not enter any international airports. Following the hearing, reports The Guardian, Pistorius "left the magistrate court in a truck ... chased by reporters on motorcycles." His next court date is June 4. 7:10 a.m. 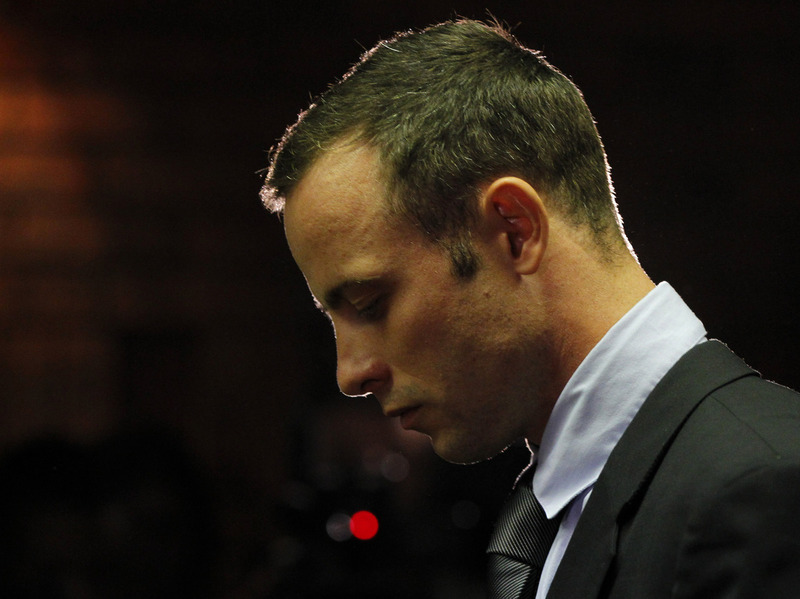 ET: We're due to learn this morning whether South African Olympic and Paralympic sprinter Oscar Pistorius will be granted bail as he awaits trial in Pretoria on a charge of premeditated murder in the Feb. 14 shooting death of his girlfriend, Reeva Steenkamp. As NPR's Ofeibea Quist-Arcton tells our Newscast Desk, "the defense and prosecution have delivered their closing arguments" in a bail hearing that has lasted four days and at times felt like a trial. Pistorius, she notes, says he thought Steenkamp was an intruder and killed her by mistake at his home. The prosecution has offered evidence that it believes shows he knew what he was doing — including a neighbor's account of shouting coming from the house before shots were fired. There's much more about the case in our previous posts. The 26-year-old Pistorius, known as the "blade runner" because of the carbon-fiber prosthetic legs he uses, is the first double amputee to have participated in a Summer Olympics and is a Paralympics champion. Steenkamp, 29, was a model and aspiring reality TV star. "I come to the conclusion that the accused has made a case to be released on bail," South African Chief Magistrate Desmond Nair just declared in a Pretoria courtroom. Then he adjourned the hearing for five minutes. Update at 9:10 a.m. ET. Another Hint That Bail Will Be Granted? "I cannot find that it has been established that the accused is a flight risk," says Chief Magistrate Desmond Nair. Update at 9:07 a.m. ET. A Hint About The Decision? The defense, says Chief Magistrate Desmond Nair, has "failed to show this court that there's a weakness in the state's case" that would compel him to grant bail. But, he adds, the state's case is not "so strong and watertight" that it's obvious Pistorius would decide he "needs to flee or evade his trial." That could be a sign that Nair is leaning toward granting bail. But, he still hasn't announced his decision. Chief Magistrate Desmond Nair, who has been speaking for the better part of the last 90 minutes, continues to discuss the case, the law and the evidence both sides have presented. He hasn't yet, though, given his ruling on whether bail will be granted. Chief Magistrate Desmond Nair has come back to the bench. It's unclear why, but Chief Magistrate Desmond Nair just adjourned the hearing for what he indicated might be about five minutes. Moments before, he had said that prosecutors had presented enough "circumstantial evidence" to merit considering the charge of premeditated murder as he debates whether to grant bail. Update at 8:30 a.m. ET. Decision Soon? Chief Magistrate Desmond Nair has been speaking for nearly an hour. He has recapped the evidence, discussed the history of bail and current South African law, and appears to be getting close to announcing his decision. Storyful is curating tweets from journalists covering the trial. Desmond Nair, the chief magistrate who is presiding over the bail hearing, has come back to the bench. The Guardian is among those live blogging from the court and audio from the courtroom is being streamed here. South Africa's News 24 says it could take an hour for Nair to deliver his decision. He's beginning with a discussion about whether there should be TV coverage of the trial.